The food project is going well. Today the letter E was on the menu. I went for the obvious thing; eggs. Eggs are versaile, you can prepare it in many ways. Like; porched, boiled (soft, medium, hard), scrambled, fried in a omelete…. The choises are many. Today, for breakfast, I went for a medium boiled egg. 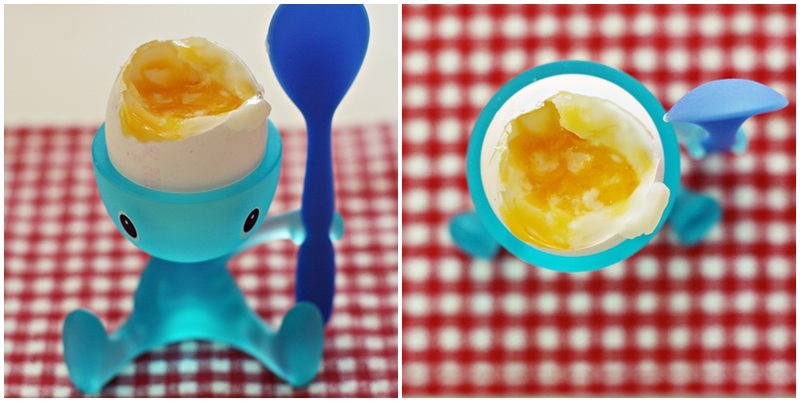 And I placed it in my fancy designer egg cup from Alessi. 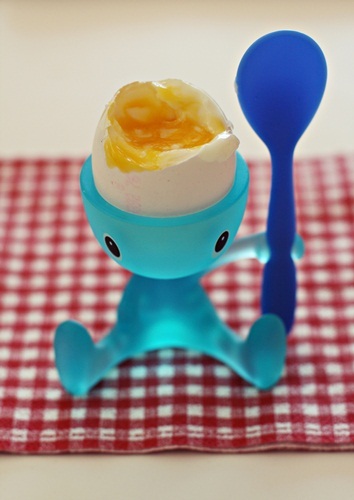 The egg cup comes with a cap and you can put salt in the cap. Very pratical. Here is another angle of the egg cup. 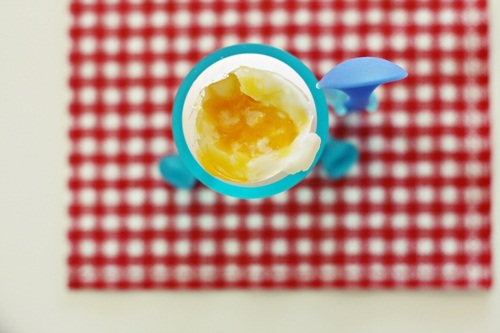 You don’t see that much of the egg cup, but I liked the composition. Since I’m so utterly indecicive, I had a hard time deciding what photo to use for my project. It went so far I used a aid: I called a friend. She suggested I take them both and make a diptych. Not a bad idea. So here’s the photo. I like sunday mornings when you can sit by the dining table; eat breakfast with eggs and a cold glass of milk, listen to new discovered music (Brandi Carlile) and read the newspaper. And when you look out, you’ll see the sun shining from a blue sky. Here the other day I cleaned my fridge. It was past due. A conversation with a friend made me do it. 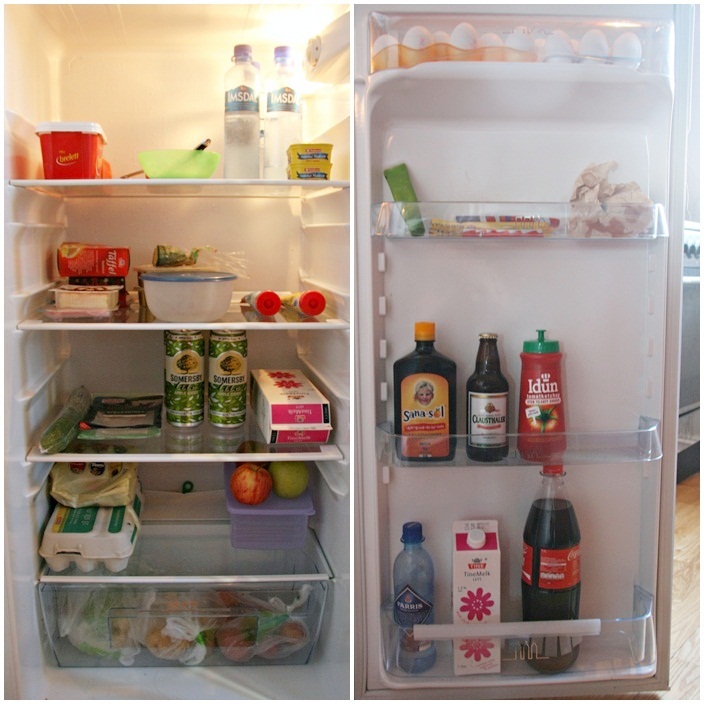 Since I’m doing this food project I thought I could take a ‘what’s-in-my-fridge-photo’. So I did. Top-left: butter, bowle with icing, water, macerel in tomato sauce. Second-left: different kind of cheese, ham, plastic box with half a slice of salami, two boxes with liver paste and cucumber on top behind the plastic box, creamy cheese; one with bacon and one with ham. Third-left: cucumber, salted ham, apple cider, milk. Fourth-left: box with eggs, bag with chocolate, empty box with apples on top. Second-right: wasabi-paste, chocolate, paper bag with one mushroom. Third-bottom: vitamines, none alcohoilc beer, ketchup. Bottom-left: sparkling water, milk, coca cola. Next letter is F. Look out for som fruit, fish, figs or maybe fettuccine…. Ps. You can follow my food project here. Really fun! Love the egg guy, and the gorgeous colors in each of those photos. Fridge cleaning… that was one of the last tasks I did before I went on holidays!